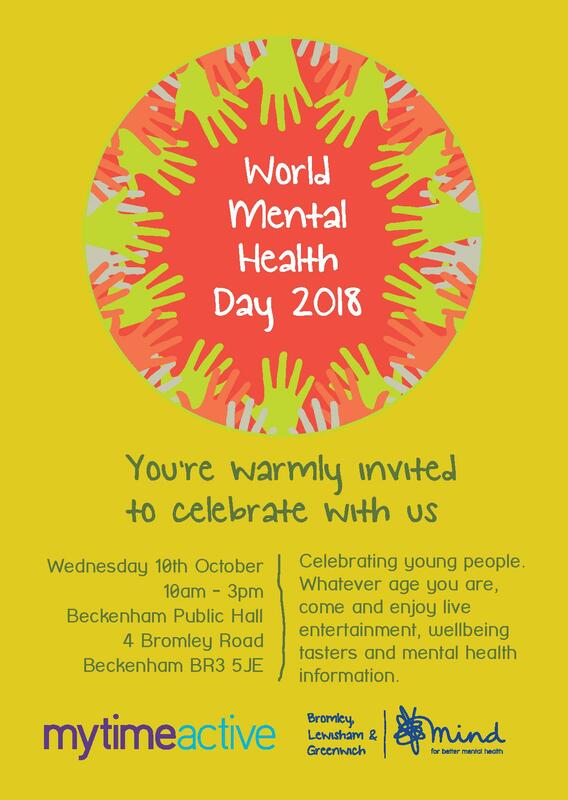 Bromley borough celebrated World Mental Health Day 2018 on Wednesday 10th October at Beckenham Public Hall. 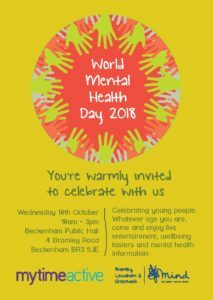 BLG Mind Bromley mental health services worked in partnership with Mytime Active, other local organisations and services, service users, and the general public to celebrate around this year’s theme of ‘young people’s mental health in a changing world’. Information stalls were held by BLG Mind’s Recovery Works and Mindful Mums, Bromley Well, Churchill Theatre’s Creative Learning, Change Grow Live, Oxleas NHS Foundation Trust’s Early Intervention team and Bromley Y. Young people supported by Arts Train performed songs in the morning. In the afternoon, they ran a workshop involving participants in writing lyrics and music for a song recording at the end of the session. Year 9 and Year 11 students from Charles Darwin School performed two honest, incisive and well-performed pieces. One performance piece highlighted the high levels of suicide amongst males over 55 years old. The second consisted of sketches showing how young people deal with mental health problems such as depression and OCD. The Main Hall featured BAM (Bromley Arts Music), Pods and Rockers and performances from Freddy’s Music Group, singing and playing covers of popular hymns and songs. Other workshops included yoga, drama and singing, run by Bromley Recovery College and Bromley Mindful Mums. Some mothers, babies and toddlers also enjoyed a tailored play area. About 130 people attended the event which proved to be a positive, fun and informative day for people of all ages to experience how they can look after their own mental wellbeing. In Lewisham, BLG Mind staff and Peer Support Volunteers held a stall and ran mindfulness sessions at a World Mental Health Day event at Lewisham Hospital.